Upon arrival, other bloggers and I were greeted by Ian Blackburn – founder of LearnAboutWine.com – and the first of five wines we would try that night. Also there were Fiona of Gourmet Pigs, Wandering Chopsticks, Maya of ShopEatSleep, Shelly of FauxLAHipsterÂ and Caroline on Crack so I was in good company. I am partial to cabernets so one of my favorite wines of the night was a Semler from Malibu Family Wines – the vineyard of which is located at the top of Mulholland. The other was a very impressive Sweeney Canyon pinot noir made from single clone grapes in Santa Barbara County. We were told there were only 700 cases of this pinot made. 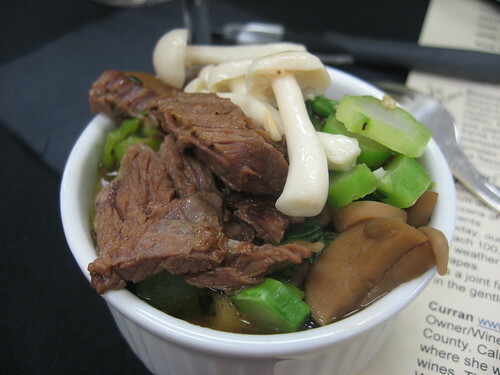 Bridget Bueche started out the pairings with a salmon salad but my favorite in the â€œstarterâ€ kitchen was a noodle dish with organic king trumpet mushrooms, chinese broccoliÂ and japanese parsley made with rice cooking wine in a danabe (clay pot). Since the entire recipe was organic, it tasted especially fresh and without the heaviness you usually get in a darker based Asian noodle soup. Place the sugar and the rice wine vinegar in a small saucepot. Cook over medium high heat, stirring until the sugar is dissolved. Continue to cook over medium high heat until the mixture isr educed by half and remove from heat. Add minced jalapeno and chopped garlic. Cool in ice bath until room temp and add fish sauce to finish. Reserve. But the favorite dish of the night was steamed black mussels in red curry coconut broth. It was creamy with just the right amount of red curry flavor. Paired with it was the Sweeney Canyon chardonnay â€“ an 8-year-old variety made with no wood and therefore no oxidation. It had a green-gold color and complimented the mussels nicely. Below is the recipe for the mussels â€“ probably the first seafood dish Iâ€™d ever venture preparing at home. (Did I ever say I was a cook?) 😉 The recipe has plenty of ingredients but are simply combined with each other to simmer. 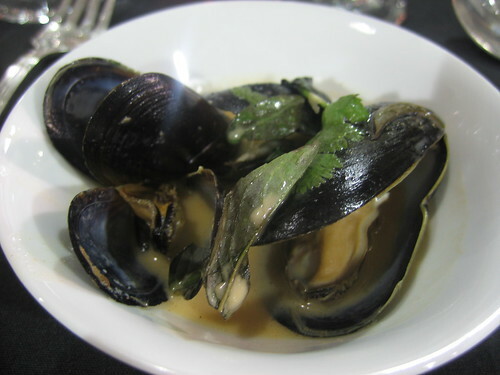 Place all ingredients except mussels into heavy sauce pot and simmer over low heat for Â½-hour. Remove from heat, strain, cool and reserve. When ready to prepare mussels: place mussels in sauce pot with above mixture, cover pot and cook on high flame until mussels are steamed and just opened. Serve with grilled sourdough bread. These mussels were delicious – I only wanted more! Fortunately I got to steal one of Caroline’s since she had the gall to request some of the few that were left. My goodie bag also had a bottle of the Semler wine we tasted during the class! Score! Unfortunately, theÂ next Culinary College previously scheduled for August has been postponed. Stay tuned for the rescheduling. 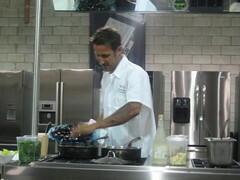 This entry was posted in Food, Santa Monica and tagged Culinary College, LA Mag, Los Angeles Magazine, Snyder Diamond. Bookmark the permalink.